A Nebula is an interstellar cloud made up of dist and gases. The word "nebula" is latin for cloud. These astronomical objects are regions where stars are made due to the materials present in the nebula which are needed to form a star. Dust and ionized gasses such as hydrogen and helium start to amass together getting larger and larger until they become massive enough to form a star. Some of the materials present in the nebula can also form planets and other astronomical object. Abell 33 found in the constellation Hydra, 2500 light-years from Earth, is a planetary nebula. This type of nebula does not form planets as the name implies. It was a misnomer that has been carried on when William Herschel incorrectly thought of that and coined the term. It has been called that every since. Planetary nebulas are emission type nebulas that are formed when stars eject ionized gas in its later stages, this gas forms an expanding glowing shell. They are important in the evolution of stars since planetary nebulas contain heavy elements such as carbon, nitrogen, and oxygen. The remnant of Abell 33’s progenitor star, on its way to becoming a white dwarf, can be seen just slightly off-centre inside the nebula, visible as a tiny white pearl. It is still bright — more luminous than our own Sun — and emits enough ultraviolet radiation to make the bubble of expelled atmosphere glow. 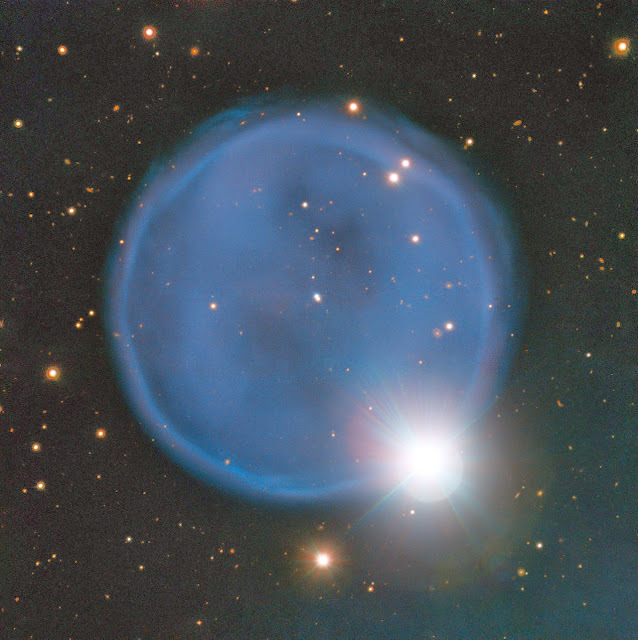 Abell 33 is just one of the 86 objects included in astronomer George Abell's 1966 Abell Catalogue of Planetary Nebulae. Abell also scoured the skies for galaxy clusters, compiling the Abell Catalogue of over 4000 of these clusters in both the northern and southern hemispheres of the sky. This image uses data from the FOcal Reducer and low dispersion Spectrograph (FORS) instrument attached to the VLT, which were acquired as part of the ESO Cosmic Gems program.